- Lynn Fells Parkway Bridge (No. M-14-001, M.P 7.10), carrying two tracks of the West Route commuter rail service over Lynn Fells Parkway in Melrose, MA. - Parker Street Bridge (No. L-04-33, M.P. 25.99), carrying two tracks of the West Route commuter rail service over Parker Street in Lawrence, MA. - Commercial Street Bridge (No. L-18-001, M.P 10.59), carrying two tracks of the East Route commuter rail service over Commercial Street in Lynn, MA. - Bacon Street Bridge (No. W-13-011, M.P 16.07), carrying two tracks of the Framingham/Worcester commuter rail service over Bacon Street in Wellesley, MA. - Intervale Road Bridge (No. W-29-016), carrying two active tracks of the Framingham/Worcester commuter rail service and two abandoned tracks over Intervale Road in Weston, MA. - New Hampshire Main Line over High Line and Railroad Yard Bridge (No. S-17-043, M.P 1.13), carrying two tracks of the New Hampshire Main Line commuter rail service over High Line Road and Railroad Yard Tracks in Somerville, MA. I find it interesting that both of these bridges have four bridge decks, but only the Intervale Road project mentions the additional two abandoned bridge decks. From what I can glean from panning straight up on Street View, Commercial St. Lynn's decks are structurally unified while Intervale Rd. has structurally separate decks for each track. But Commercial has full-regulation underclearances for the road, while Intervale is a scary little low-and-narrow clearance cowpath. I doubt you can glean anything about scope-of-work from those descriptors. I'd be more interested in what the scope of work around Intervale does about the clearances and whether they're going to cleanroom the abutments and carve out the minimum road clearances for emergency vehicles to get through. Commercial's a lot more straightforward: A) Rip all 4 tracks worth of decking off, replace 2, leave 2 blank for future action; B) Rip all 4 off, replace all 4; or C) Structurally separate, rip 2 off and rebuild, leave 2 old/2 new. Last edited by CRail on Mon May 29, 2017 11:07 pm, edited 1 time in total. Reason: Yet another series of quotes within quotes within quotes removed. Are they going to put the two Framingham line bridges back as quad track or two tracks, or two tracks with four track wide abutments? I would almost guarantee the latter; they almost never get rid of the entire abutments because of the effects that has on the grade. (You don't just remove a retaining wall and expect the soil and such to stay in place.) It is basically 0 cost for them to provide for future expansion, especially when the abutments are already that width. It would on the other hand add much greater costs to add two bridges that aren't needed, or build a bridge twice as big as needed in the case of another unified deck bridge. Sure, economies of scale, but that bridge would be sitting for many years before being used, and would need to be maintained. Here is an example of how they handle bridge replacements on old stone abutments, by the way. (Not in MA, this is along the Shore Line when Amtrak electrified east of New Haven.) Just picture two extra spaces for the bridge in your mind! The Intervale Road bridge in Weston will be rebuilt to accommodate 4 tracks without structural modification in the future. The rails will not be installed at this time. The entire bridge will be replaced (as opposed to just working on the two center tracks). I believe the intent is the same for the Bacon Street bridge in Wellesley, but I haven't had that confirmed yet. 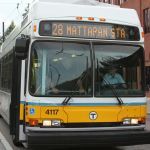 With no ability to easily add tracks between Route 128 and Boston, the plan is to 'future-proof' the Route 128 to Framingham (at least) ROW for additional track(s). What are they planning for the additional tracks? Express operations? Inland regionals? Green Line Extension? Is some of the row sold off/compromised in Wellesley? They're not planning anything today. But bridges have a 60-75 year lifespan (and usually much, much longer on the stone abutments), and beyond 50 years it's absolutely unprojectable what the needs are going to be. Could this need to be a quad-track railroad in the year 2092? We don't know. But seeing as how that's further in the future than you can count back years past to when 4 Boston & Albany tracks were saturated with traffic...that's not a bet I'm willing to make my great-grandkids eat. So why spend extra to mod the abutments to delete that pre-existing feature when it's cost-neutral to keep the berths half-deckless but maintained in-place. FWIW...Commercial St. Lynn is a bridge that the Blue Line will go over on the 2 empty berths in any design permutation of BLX Wonderland-Lynn, so that's obviously one that they have good reason to rehab the entire abutments even if only 2 berths are getting a prefabbed deck right now. As for the Worcester Line, assume 20 years in the future and a *thick* layer cake of locals, expresses, super-expresses, and intercity traffic. Maybe so thick that they need a few tri-track passers in unconstrained areas simply because crossovers alone aren't going to manage all the overtakes. Well, West Station-Boston Landing has a tri-track passer in the works pending final Pike realignment design, and the new ADA Natick station is being built with a provision for a tri-track passer. Where would the next logical, equidistant place be for an Amtrak or a super-express passer between those two spots? Probably Riverside Jct.-Wellesley Farms for sorting traffic after the Indigo trains cross over and pull out onto the Riverside spur...which could mean plunking another deck on top of those Intervale abutments. That's unprojectable with what service increases have been studied right this second for the layer cake...but say the Inland Route is a big hit and it's time to study second-wave service increases with a few more intercity leapfroggings of an ever-denser commuter schedule? Yeah, if that's the spot the railroad's schedule resiliency would most benefit with some capacity padding you could feasibly see a study rec for a Weston passer handed down in less than 20 years...when those rehabbed Intervale abutments still have relatively fresh workmanship. The one in Lynn is two separate bridges. Refresh my memory: isn't this the one where the T and the town of Melrose were negotiating using a nearby field asa staging area? (baseball/tennis/high-school/public works). Did that get resolved? Correct, that is the one. I don't know if the conflict was ever resolved, though. Haven't seen anything about it since.